NUMBER 50 our last entrant is Chris Jericho! NUMBER 47...is Shane McMahon! Kevin Owens doesn't look too pleased. Daniel Bryan has set a new record for the longest stay in a Royal Rumble - at one hour and five minutes. NUMBER 45...is The Great Khali! NUMBER 43...is Curt Hawkins! 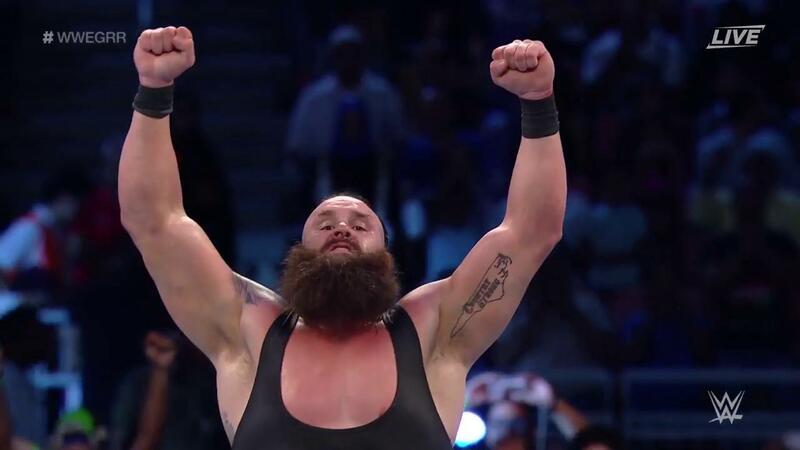 He doesn't want to get in the ring, and tries to run away but Braun chases him down and drags him to the ring. Strowman launches Babatunde and Dan Matha out immediately! And Big E and Heath Slater for good measure. NUMBER 40...is NXT prospect Dan Matha! Not a particularly smooth entrance - he tripped over and slid under the ring! NUMBER 33...is Apollo Crews! Karl Anderson! NUMBER 31..is Big E! And he makes a big impression, initially with some pancakes, and then by eliminating Tucker Knight. NUMBER 30..is Tyler Breeze! 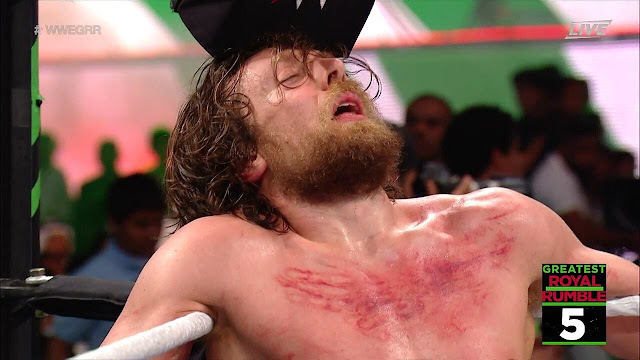 But he's straight out - at the hands of Mojo Rawley. NUMBER 29...is Mojo Rawley! And straight away he knocks out Fandango! NUMBER 28!...is Rey Mysterio! Booyaka booyaka! NUMBER 24...is Tucker Knight! From the NXT tag team Heavy Machinery. NUMBER 20...is Elias! And he has his guitar with him! NUMBER 19...is Konnor from the Ascension! NUMBER 16...is Kurt Angle! To a huge crowd reaction. Number 14...is Xavier Woods! 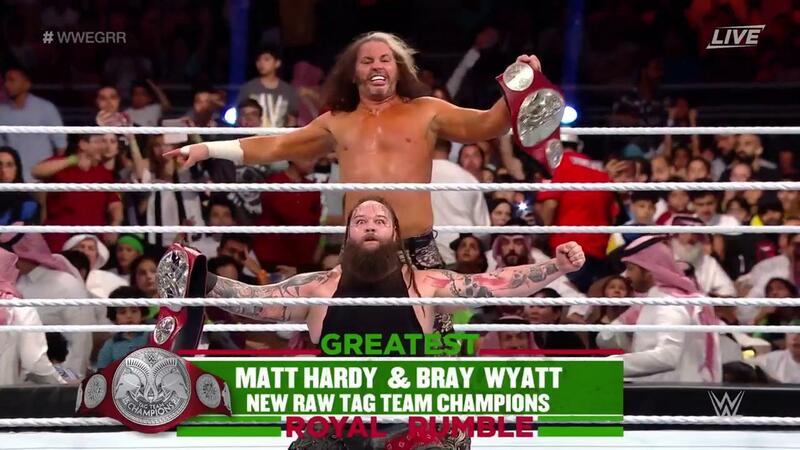 We have two New Day members now. And the first thing he does is help eliminate Wilder! NUMBER 11...is Dash Wilder from the Revival! NUMBER 10...is the premier athlete, Tony Nese! NUMBER EIGHT...is Viktor from the Ascension! And is swiftly knocked out by Bryan. And he's immediately eliminated by Mark Henry, for what could be a new record. NUMBER Three! is Sin Cara!, 2 was Dolph Ziggler!, NUMBER One - Daniel Bryan! Both men look in great shape from unset, with The Game takes an early advantage by overpowering Cena at a lock-up.This crowd is RED HOT and completely behind John Cena. We just got a huge pop for a one-count at a pin attempt by him. Tentative start so far. We've had an old-school test of strength and plenty of 'feeling out'...But Cena gets one back, does his "you can't see me" taunt and the crowd goes wild! Let's make it short. Triple H transitions an STF into a crossface but Cena picks him up and hits a huge AA! A slingshot into the corner and another AA and that's it! Cena kicks things off with a win! English is rolled into the casket alongside Rusev. And Undertaker slams the lid shut! English hits the ring before Taker can close the lid and takes a HUGE chokeslam and a Tombstone piledriver. But not a second one! Taker ducks a Rusev clothesline and hits a picture perfect chokeslam before rolling Rusev into the casket. But Rusev avoids the chokeslam! Rusev attempts the Accolade but Taker breaks out of it. Rusev calls for the casket to be opened but as he does, the Undertaker sits up! Taker gets back on top but Rusev responds with a superb spinning heel kick to retake the momentum. Taker rolls Rusev into the casket! But Aiden English stops him from closing the lid and the distraction lasts long enough for Rusev to climb out. When the action returns to the ring, Rusev levels the Dead Man with a massive Machka Kick and rocks him with a series of corner punches. 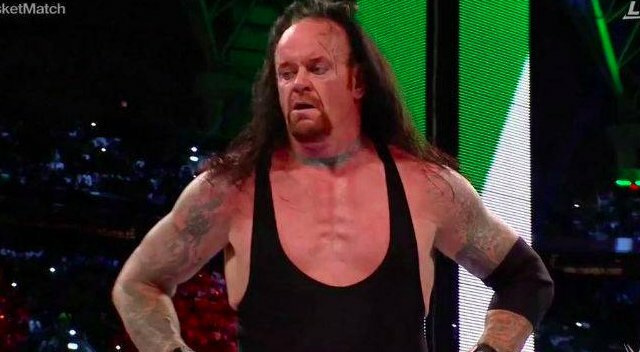 Rusev enjoys a brief attacking flurry but Taker is soon back on the front foot and delivers a devastating apron leg drop! As you would expect, it's all Undertaker. The Bulgarian Brute just ate an Old Skool and was rolled onto the top of the casket, but very quickly got himself out of there! And steps back out, shaking his head. But Taker follows him out and drills him with a pair of right hands. The casket is open. The bell has rang. Rusev tentatively steps into the ring. 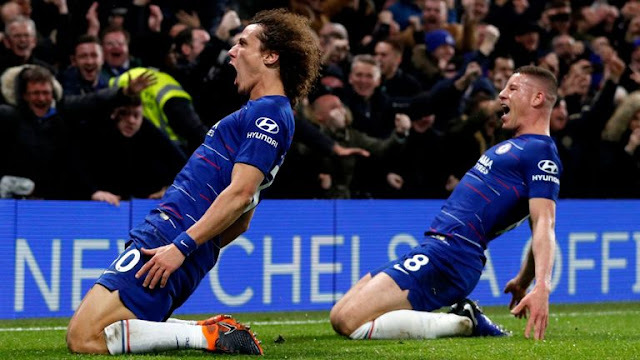 A hugely controversial finish to this match. 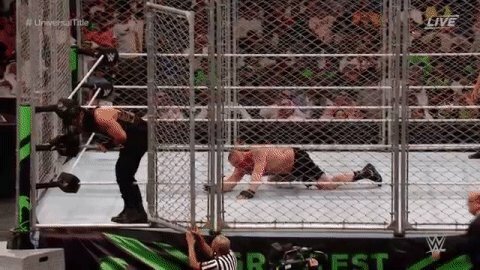 Technically Brock left the cage first, but Reigns' feet touched the ground before his. Brock landed first and so he technically escaped the cage first! Brock makes it up but gets put down with a Superman Punch! And a Spear through the cage! The cage is broken! Reigns drops Lesnar with a chair and continues to brutalise him with it on the ground. Reigns is showing plenty of fire here! 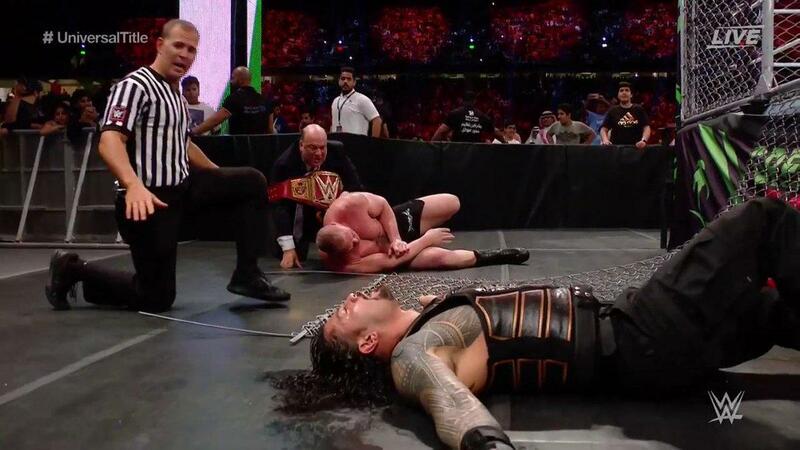 Lesnar goes for a chair attack but Reigns hits a Spear and gets another near fall! And Lesnar has taken his MMA gloves off.. He's almost out but Paul Heyman slams the door on his head! Lesnar scoops him up for an F5 and a two! A third Spear! And a cover, but Brock kicks out! 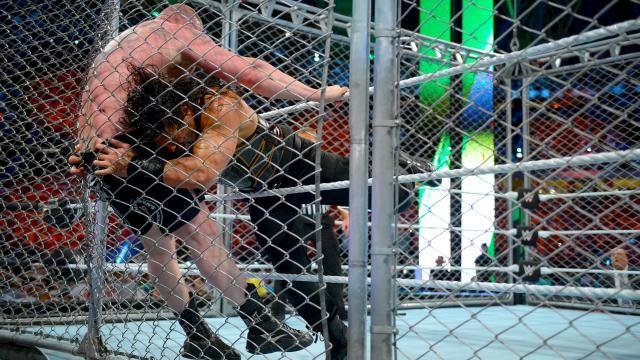 Reigns rattles Lesnar into the cage three times and then nails a ferocious Spear! And another one! Reigns lifts him up for a massive powerbomb and the Beast is rocked. Lesnar elbows Reigns to the mat and now he's climbing the cage but Reigns grabs his foot! Reigns climbs the cage! He has both legs over but Lesnar grabs him on the top! Lesnar goes for another F5 but Reigns hits a hat-trick of Superman Punches! Another German and an F5 for good measure! Suplex city! Lesnar hits three Germans to kick this one off in dominant fashion! more preoccupied with Roman Reigns lately — but he was more than happy to punish everyone in sight by using the ladders as weapons. It was going to take a big swing to keep him down, and Bálor was happy to supply it, tipping Joe off the ladder to finally subdue him. 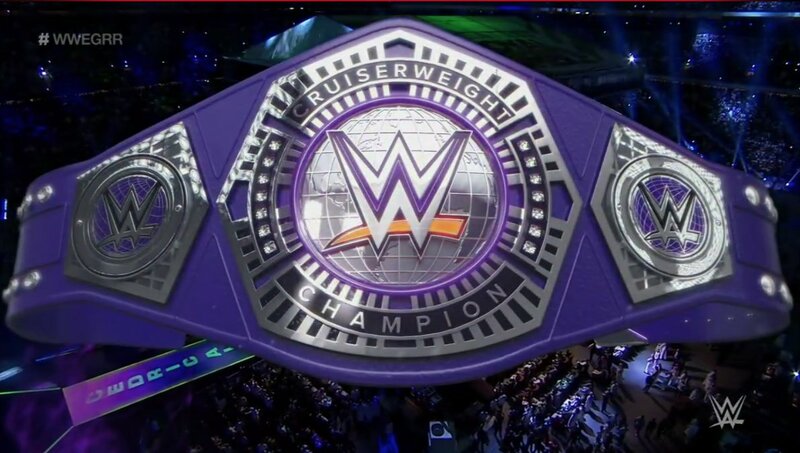 As for Rollins, the champion found himself waylaid at each turn and unable to gain a lead secure enough that would allow him to retain the title. 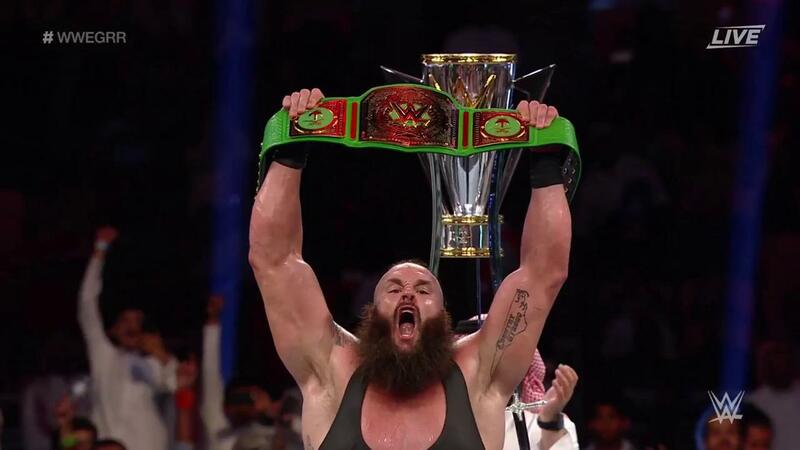 So, he settled for a quick-strike surprise: Moments after Bálor sent Joe tumbling off the ladder and began to ascend, The Architect springboarded onto the rungs, sprinted up into the lights and ripped the title from its hook before Bálor even knew what had happened. Sunil Singh attempts to attack Hardy and while he's not successful, it does lead to Jinder almost getting a Khallas out. But Hardy gives him a Twist of Fate and a swanton bomb for the three count! This one has already spilt to the outside - Hardy launches a flying elbow off the barricade onto Jinder! Jinder Mahal seemed to have given himself an advantage going into the Greatest Royal Rumble event. 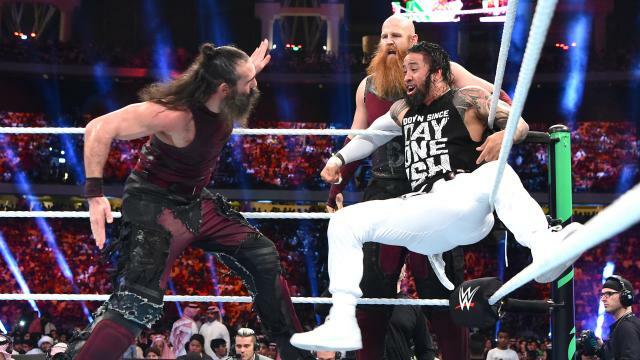 He had sent Sunil Singh to SmackDown LIVE to attack Jeff Hardy ’s knee ahead of their United States Title rematch. However, The Charismatic Enigma was able to fight through the pain and withstand Mahal’s punishment, retaining the star-spangled championship at the sold-out King Abdullah Sports City Stadium. Hardy gets a Twist of Fate on Sheamus but can't capitalise before Wyatt stuns him with the spider walk before a big Sister Abigail! The Bar think they have it after Cesaro lays out Hardy and Sheamus nails him with a top-rope elbow drop but the Woken One breaks up the pin and manages to tag in Wyatt. 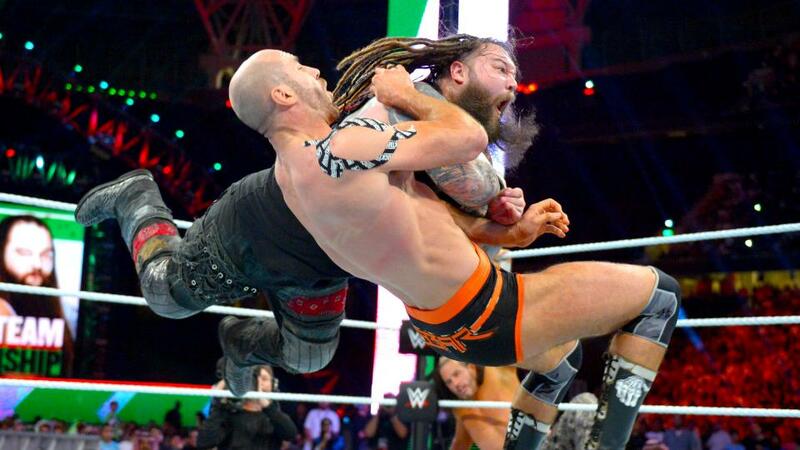 Wyatt cleans house and sends Cesaro flying with a fierce elbow smash. The Bar have been in control of this one so far. Hardy has been isolated and they're working him over with some quick tags. 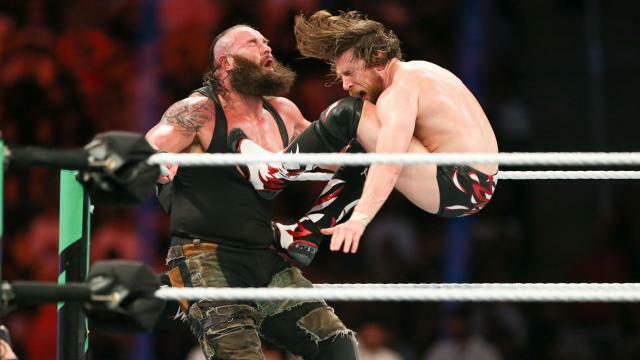 the malicious champions came to the King Abdullah Sports City Stadium in a foul mood, keeping the pressure on The Usos in the early goings. Kalisto goes for a Solida del Sol but Alexander turns it into a Lumbar Check and gets the three-count! Alexander catches Kalisto as he attempts a top-rope huracanrana and looks for a powerbomb but Kalisto pulls out a seated springboard Spanish fly! An incredible move! 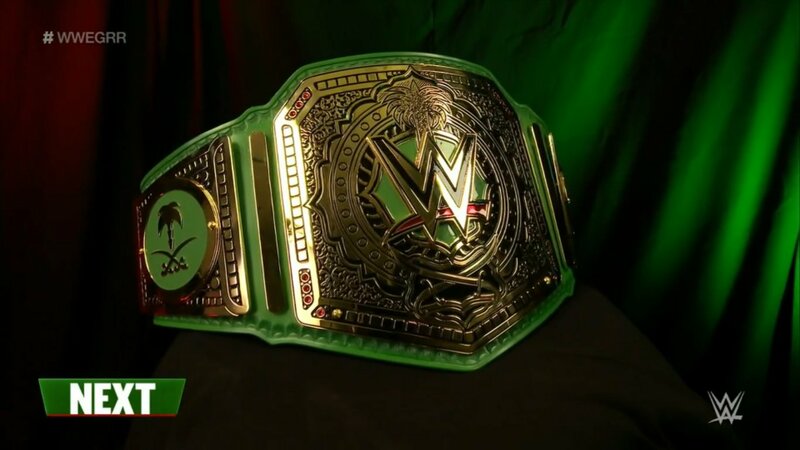 The champ has lowered the pace a notch and has got Kalisto in a reverse bear hug on the mat but the luchadore rallies and hits a picture perfect cross body from the top rope. Alexander hits a dropkick which has more air than a pair of Jordans but can't quite get the three count! And Alexander rallies to dump Kalisto to the outside and hit a huge tope of his own! Goes without saying this a major style departure from the opening match! Both men have already exchanged some rapid-fire offence and Kalisto hits a springboard plancha to the outside to level Alexander!